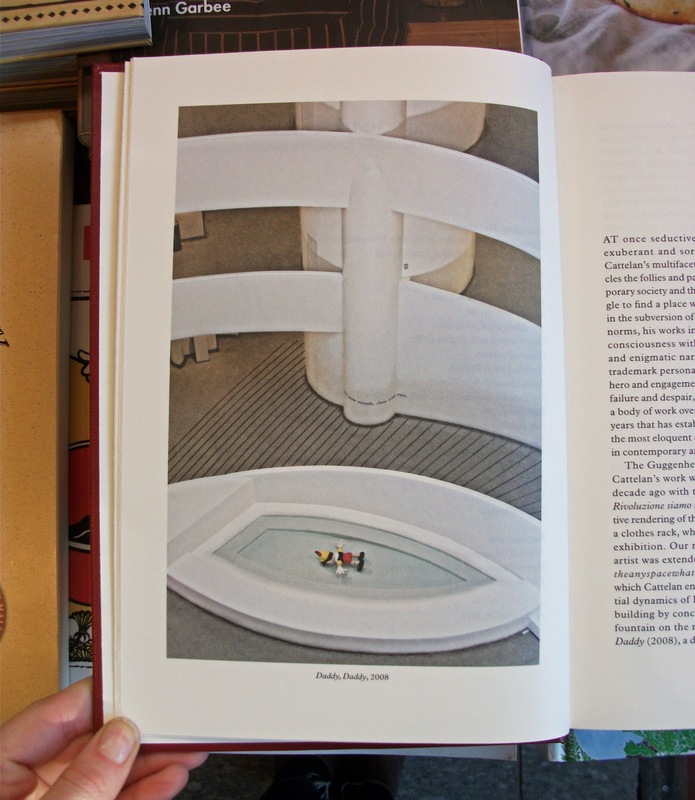 I had the opportunity to see Maurizio Cattelan's retrospective (and claimed art career finale) at the Guggenheim last month. With a typical disregard for art world systems, Catellan has had the hundred and twenty-eight pieces in his retrospective, mostly large-scale sculptures, mounted as a massive mobile. 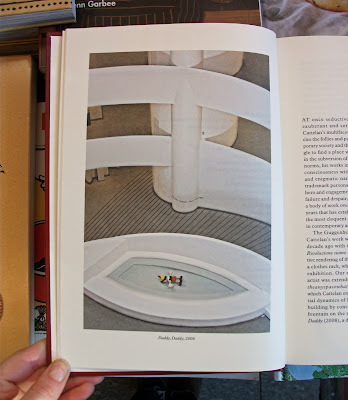 Suspended from the ceiling, All fills the void at the center of Frank Lloyd's spiral, leaving the walls of the circling ramp completely blank. There are no title cards or other points of reference; you're just left to experience the objects of Catellan's career as a whole as well as the museum architecture. The catalog, however, is all context—essays, bibliography, exhibition history. Its extensive illustrations are fully indexed. 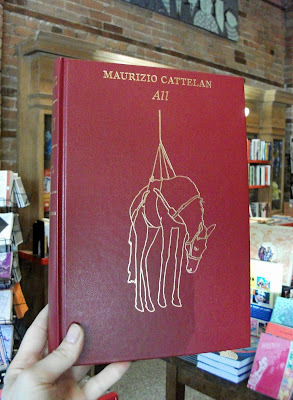 Catellan has made a career out of art institution provocation (he once notoriously taped his Milanese gallerist to his own wall). This time, interestingly enough, his disruption (of the expectations of the retrospective to trace, to venerate) ends in reverence to the venues for his art. With All, Catellan has made his exhibition all show and his catalog a true catalog. 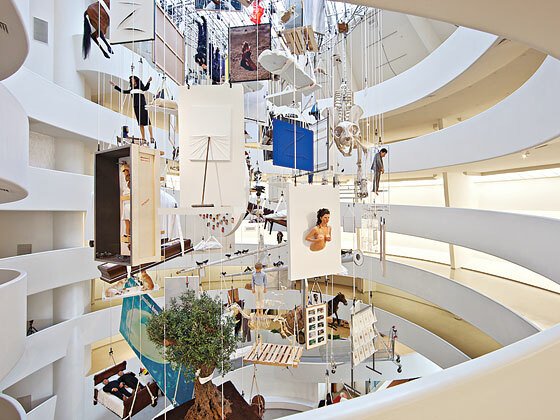 Page from All, Cattelan's installation piece Daddy, Daddy at the Guggenheim (2009). Cecil Beaton: The New York Years, on at the Museum of the City of New York, showcases the best from photographer, illustrator, costume designer and celebrity of celebrities, Cecil Beaton. 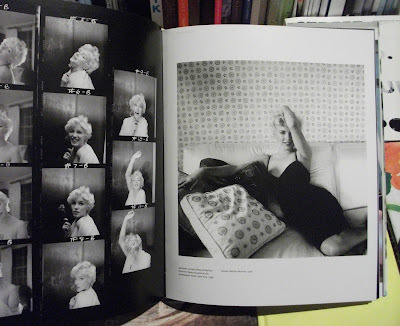 Beaton (1904-1980) was a kind of Warhol/Capote type figure, someone whose self-promoted personality was as much a product as and totally integrated to the work he did. 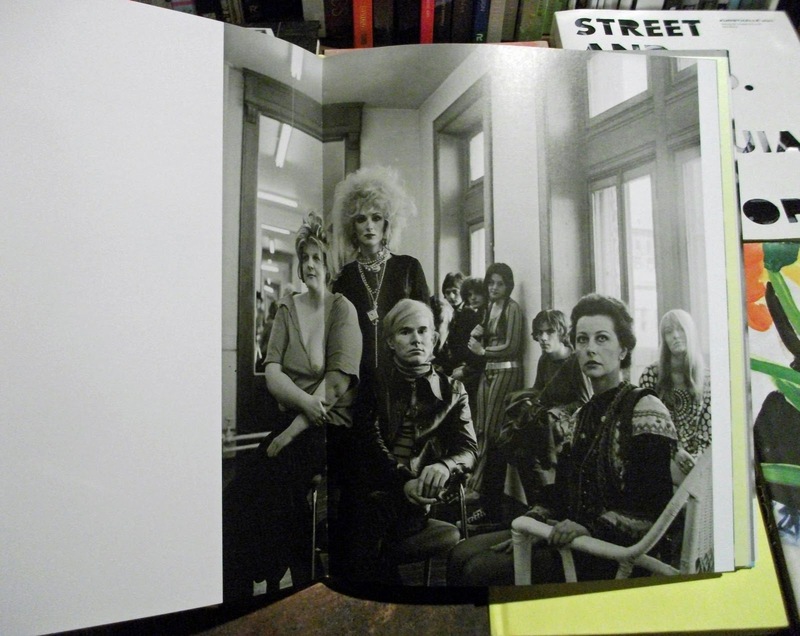 The world he promoted was glamorous and celebrity driven—Greta Garbo, Marilyn Monroe, Marlon Brando and Coco Chanel are just some of the personalities portrayed in this coffee table catalog which, along with his photographs of the famous, includes sketches and designs that the artist drew for the movies, theater, opera and fashion. For more about All, check out Peter Schjeldahl's review in the recent Food Issue of the New Yorker and his accompanying audio slideshow. The New York Times reviews the Cecil Beaton book and exhibition.